The Houlton Rotary Club met for its luncheon meeting on Monday, Nov. 26, at Watson Hall. HOULTON, Maine — The Houlton Rotary Club met for its luncheon meeting on Monday, Nov. 26, at Watson Hall. There were several guests present. Rotarian Leigh Cummings hosted his wife Sandra and his daughter Kate and grandson Blake. Rotarians Wade and Pat Garrison visited for lunch, while traveling from their home in Bridgewater, Nova Scotia to their destination in Florida. They were very enthusiastic about some of the businesses that they had discovered in Houlton. Rotarian Mac Randolph reported on the grand total from E-Waste Day that turned out to be 99,800, which is an increase of 20,000 pounds over last year’s total. The Dead River Company raffle drawing was held during the meeting and Polly Joslyn won the $500 certificate for product donated by Dead River. The big question of the day was “How did we do?” This is always the question after the months preparing for the Annual Rotary Auction. President Nate Bodenstab answered that the club did great as more than $46,000 was raised by the auction. This money will be spent on various service projects this year in the community. 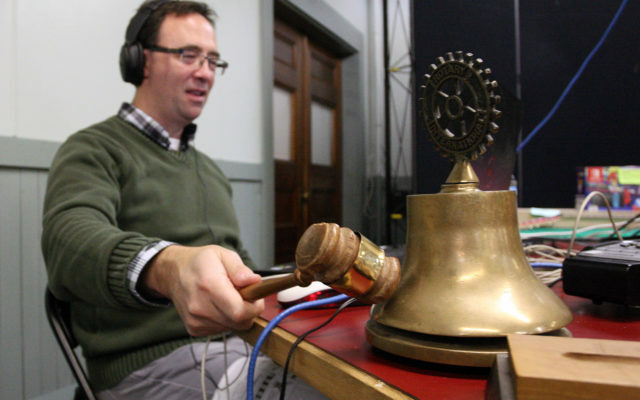 Houlton Rotarian Scott Dionne gives a thumbs up to signal a good bid during the 63rd Annual Rotary Radio, TV and Internet Auction Monday, Nov. 19. Also, six “Boy and the Boot” sculptures were sold during the auction, $750 was raised for the Cary Library and $450 in general gifts to be used for Rotary service projects was pledged. The Rotary Club then worked to assess the workings of the auction and to determine if any improvements could be made for the future. Each table reported their findings. It was suggested that the Facebook auction page be used more for certificates as ratios were better on Facebook from those sales. The 20 minute auction sessions were new from the 30 minute sessions used in the past. This did not negatively impact the auction and many folks found this an improvement. More training was suggested for answering the phones and keeping tabs on the auction board results. This would allow for more accurate bids and avoid low bids. An extra phone line was suggested and another idea was to have more “random” pick up on the phones. Some phones were busier that others and either of these suggestions could improve this process. More descriptions are needed on the auction cards for the flyer such as size and color for clothing. Everyone enjoyed the introductions of each auctioneer and the fun facts that were shared about the history of the Houlton Rotary Club. The storeroom will close each evening at the same time as the auction next year. Perhaps smaller bags of potatoes could be auctioned off for easier pick up in the storeroom. Another suggestion was to have banners displayed from each business that donates to the auction and show these on the broadcast when there is down time. And a great idea would be to have all Rotarians in the hall assemble at the very end of the auction to thank the community for their support and to sign off gracefully. Some folks had no break for the three night event and they received a round of applause. Rotarians Nancy Ketch, Bob Blanchette and Fred Grant worked tirelessly at the respective and very important jobs tallying results and broadcasting the evening. Grant also kept the bell ringing going each night to announce the 3 minute warning and the end of each auction period. And last but not least the food for each evening was exceptional and Rotarian Katie Hill and her assistants kept this well provisioned. The Annual Rotary Auction is truly a whole club event and it takes everyone to maintain the energy and positive attitude for the three nights and the work setting up the storeroom and distributing the auction items. It is well tuned and impressive that the club keeps improving the working of the auction each year and that is what Rotary is all about in a nutshell, making improvements in the world.